There are certain novels you have to read in order to gain admission to the cool kid's club and the earlier you read them, the cooler you can be. "Have you read Desolation Angels?" "Uh, of course, in highschool." That cool kid credibility comes at a price, and depending upon which books you're reading that price could be a modicum of your sanity. With some of the novels, Kerouac's Big Sur for example, it doesn't really matter when you read it, the book makes you insane. Like any up and coming brooding intellectual I spent many weekends as an undergraduate in dusty used book stores checking them off the list, Camus, Hesse, Sartre, Mann, Dostoevsky. The Existential movement in European literature didn't necessarily have equivalents here in the states but some of the Beat generation and those that would come after certainly sought to invoke some of this desperation and struggle to make meaning, or at the very least flounder in the meaninglessness of it all. I jumped into Kerouac and Bukowski very easily. I found a kinship with them, while I couldn't relate to the rampant alcoholism and drug use, there was a beauty in the way they used words to make the mundane seem so powerful. There were some American writers however that I cannot and do not get. The two that stick out the most are Ken Kesey and Hunter S. Thompson. Ken Kesey is most famous, very likely, because of Jack Nicholson but also because of a book he didn't write. 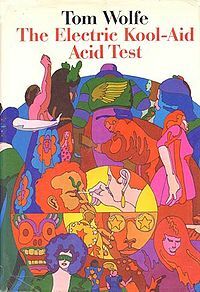 Tom Wolfe's Electric Kool Aid Acid Test. From my understanding, because I never read that book either, Kesey took a lot of LSD, drove around in a bus and hung out with the Grateful Dead and Allen Ginsberg. Some people are famous because they're talented, like Bukowski and some people are famous because they had famous friends, and from what I can tell Ken Kesey is one of the latter. He may just be the Kim Kardashian of that generation. Speaking of acid however, there's nothing more essential to a great, crisp white wine than that beautiful acidity. Not the kind of acidity that Ken Kesey would go in for but rather that screaming crisp bite of green apple that is the beauty of malic acid in wine. The retention of malic acid in wine is what a winemaker, or a wine conouseur is referring to when talking about a wine's acidity. Malic acid is one of the primary components of wine grapes, and as the grapes ripen and more sugars develop that acidity decreases. This tends to happen more in warmer climates than in cooler ones. Wine from the Willamette Valley has more acidity than wine from Red Mountain. For white wines that don't possess some of the tannic structure that the grape skins impart in red wines the malic acidity can be and often is the star of the show. 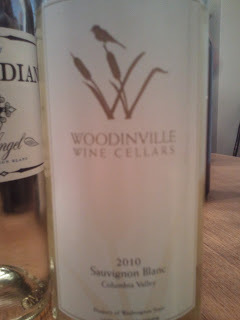 The 2010 Sauvignon Blanc from Woodinville Wine Cellars is an excellent "acid test" when it comes vibrant acidity coupled with loads of citrus fruit. Word is the 2011 is to be released real soon. Aromatics waver from tropical fruits to stony minerality and a sense of overall brightness. The citrus fruit continues on the palate and the wine delivers brilliant beauty with loads of acidity. Only 400 cases of this wine were produced and it's 100% Sauvignon Blanc, combining fruit from Red Mountain's Artz Vineyard and the cooler Stillwater Creek. For $18 it's a Friday Find for a nice warm Summer day, assuming we see one of those. Anon, they certainly are. I cannot tell however if your issue is that someone who writes a wine blog on the internet shouldn't use strong words to criticize someone considered a venerable American writer. I would assume you'd say "those are strong words for someone who writes a shopping list" or any other form of writing, for they are not related nor is the criticism of a writer mutually exclusive from writing in my view. Also, if it matters, this is not how I earn my living. The fact that Kesey is from Oregon and this blog is generally a champion of Oregon wine as well as the people who make it is actually completely coincidental. I didn't know where Kesey was from until I got to that wikipedia link. I don't know if he is one of Oregon's greatest writers, he may just have the most famous friends and be a decent writer. I also am not a fan of Chuck Palahnuik, though I tried very hard to like him and I know he's from Portland. I don't think that I need to love everything about a place to love some of it. I don't think it's a you're either with us or against us thing. I was born and raised in Pittsburgh and my sports allegiance draws the ire of many of my Washington wine acquaintances and friends, but that's okay with me, and luckily with them. I hope that you'll keep reading and thank you for taking the time to comment.